Kevin Gregg was signed on a minor league deal over the offseason, and yesterday was added into the major league roster in a surprise decision to take him over Sam LeCure. Gregg, along with fellow newcomer Burke Badenhop, will be counted on to help turn around the Reds 2015 bullpen after a rough year in 2015. As a guy with 177 career saves to his name, he would seem to bring some pedigree. He entered pro-ball, however, as a 15th-round selection out of Corvallis High School, Oregon, when the Oakland Athletics took him in 1996. It wasn't until 2003, however, that he made his big league debut after becoming a six-year minor league free agent and then ultimately signing with the Anaheim Angels. To be honest, Gregg's career as a closer seems like a shining example of how a mediocre pitcher can put up pretty nice save numbers. He's had some good seasons. In 2010, for example, he posted an 84 ERA- to go with his 37 saves for the Blue Jays. But over 2007-2011, his stint as a more or less full-time closer, was marked by an ERA only about 10% better than average (89 ERA-). He has always posted decent to excellent strikeout rates, but he has also almost always had poor walk rates and, often, fairly poor ground ball rates to boot. His stats profile looks like the classic hard-thrower who doesn't know where it's going. I was surprised to learn, therefore, that he really doesn't throw that hard. 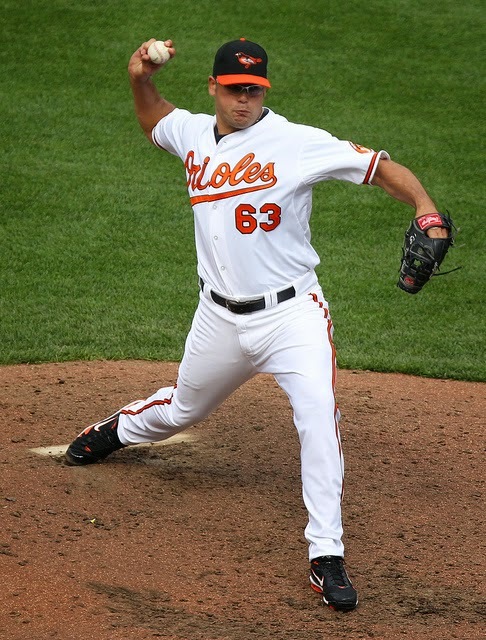 He's a big guy (listed at 6-6, 245 lbs), but his highest average fastball velocity was in 2008 when he threw 93 mph. That number has been falling in recent years, and was in the 90-91 mph range the last few seasons. So what does he throw? He throws a pretty full complement of pitches, which is probably how he stuck as a starter through the minors. It also seems like a pretty good indication of why he was tapped as a closer so often: if a team doesn't have a dominant pitcher, they should at least look to someone who can get batters from both sides out. The mix of a splitter, cutter, and curve-ball gives him weapons that break both directions on the plate, which means he should be effective against both righties and lefties. That fits his results, too: over his career, he's allowed a .311 wOBA vs. left-handed batters and a .320 wOBA vs. right-handed batters. That's a reverse split, with about 1500 batters faced in each case. His cutter seems a little slider-like to me, especially given how much slower it comes in than his true fastball. It has a little bit of rise to it (~7" vertical rise), however, so "cutter" seems like a good definition of the pitch to me. It's not a big spike. But after being down the last few years, his spring average of 93.2 mph is his best monthly mark since June 2011 (93.6 mph). I imagine that helped his cause a bit with the Reds opting to take a flier on him. Gregg is entering his age-37 season, and his projections are ugly. Steamer projects a 4.18 ERA. ZiPS projects 4.64. He is coming off season-ending surgery last August to remove bone chips in his elbow, a similar procedure (if memory serves) to what Mat Latos had prior to the 2014 season. 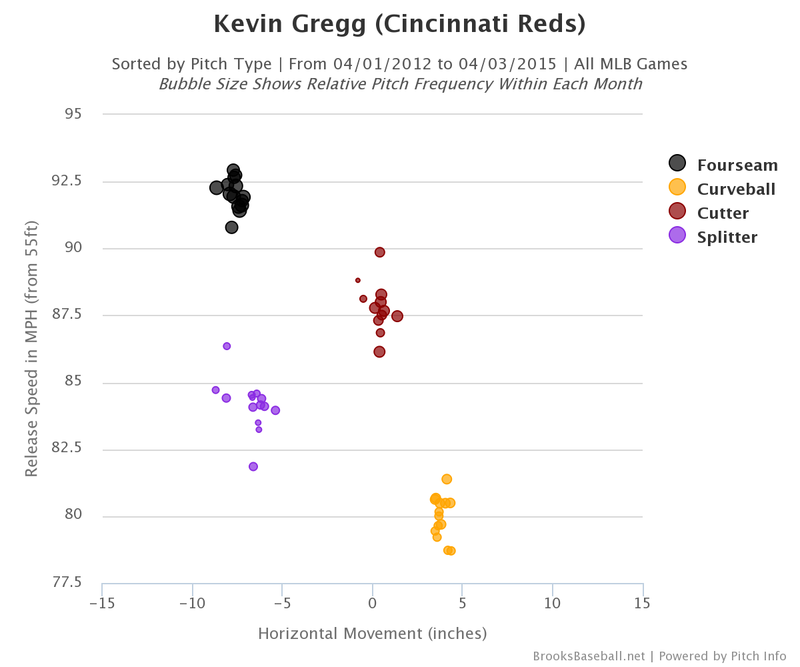 His velocity seems good this spring, based on a handful of pitchf/x games, and the Reds seem happy with his performance. If he's right, the dream is that Gregg can provide quality middle-relief against batters from both sides of the plate. And yeah, sure, maybe he's got another quality season in the tank. The concern, of course, is that if he can't keep his walk rates down (and he usually can't), his fly ball tendencies might lead to some big innings for the opposing team. There's not much else that we can do other than hope, at least, that he can down the fort long enough for Sam LeCure to figure things out in AAA.